Take control of your Rebel T3i and the images you create. 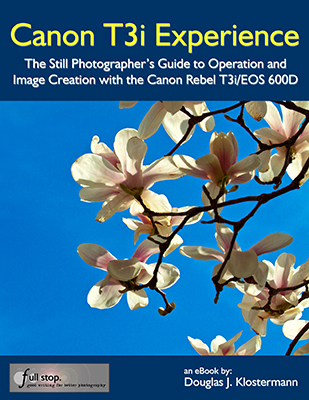 Canon T3i Experience - The Still Photographer's Guide to Operation and Image Creation is an eBook user's guide and tutorial for the Canon Rebel T3i / EOS 600D. This instant download Canon T3i / 600D book is for those who wish to get more out of their camera and to go beyond Full Auto and Program modes and shoot in Aperture Priority (Av), Shutter Priority (Tv), and Manual (M) modes. To get you started, it includes explanations and recommended settings for all Menu settings, Movie Mode Menu settings, and Custom Function settings of the T3i/600D. It covers basic dSLR camera functions and exposure concepts for those new to digital SLR photography, and explains more advanced camera controls and operation, such as using the various metering modes and exposure compensation for correct exposure of every image, controlling autofocus modes and focus points for sharp focus of still or moving subjects, and utilizing dramatic depth of field for professional looking photographs. This PDF e book can be read on your computer and printed on your printer, or transferred and read on an iPad, Android, or other tablet, Kindle, Nook, or other eReader. 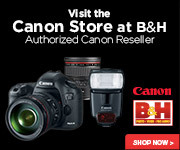 You can preview Canon T3i Experience at the following link. The preview shows the Table of Contents and Introduction, a sample T3i/600D Menu Settings page, a sample Custom Functions Settings page, and sample text pages. Click to Preview Canon T3i Experience - note to Mozilla Firefox browser users: the new built-in PDF viewer in Firefox does not work properly and causes the PDF preview to appear in a low resolution. Please download and/ or view the PDF with Adobe Acrobat / Reader to see the proper resolution. Setting Up Your Camera - All of the Menu settings and Custom Function settings for the T3i / 600D, including movie mode menus, with brief descriptions and recommended settings for practical, everyday use. Set up and customize the advanced features of this dSLR to work best for the way you photograph. Auto Focusing Modes and Drive Modes - How they differ, how and when to use them to capture sharp images of both still and moving subjects. Also how and when to use focus lock and back-button focusing. Exposure Metering Modes of the Canon T3i / 600D - How they differ, how and when to use them for correct exposures in every situation. Also how to make use of exposure lock. Photography Accessories - The most useful accessories for day-to-day and travel photography including those specific to this camera, plus recommended photography books. This digital field guide to the Canon Rebel T3i / EOS 600D is a 85 page, illustrated PDF document that builds upon the information found in the Canon Rebel T3i / EOS 600D manual, and will help one begin to master their dSLR and learn to use it to its full capabilities! Format: PDF - can be read on your computer and iPad, plus printed on your printer. The iPad and iPhone version is available through Apple's iTunes or through the iBooks App. A Must-Have Accessory - What a great addition to my bag. This is a well written, full body of work that explains, in plain English, how to get the most out of my new camera. Doug provides the knowledge and experience to bring you to the next level. I look forward to learning more every time I open the book. Definitely reduces the slope of the learning curve to an easy gradient - I found that it was easy to read and understand, full of important hints and suggestions and allowed me to get to grips with the tools available in the camera in a very short time indeed. Excellent value! Great for New T3i Owners - This is an excellent resource for new T3i owners. In my case, I was upgrading from a Rebel XT so I appreciated the "just the facts" point of view. Overall, a great resource - highly recommended! Quite a Helpful Book - It is a great foundational teaching on the camera and was a lot of help in getting me comfortable with the controls. I also found the personal experiences and thoughts shared by the author to be quite helpful. I have recommended and will continue to do so. It really made using the Canon Rebel T3i very simple - I also liked the fact that it is in pdf format, which means I can keep it on my iPhone or iPad while I'm out in the field. The price is right, the product is sound and most of all, the information is useful. Excellent T3i Learning Jump Start - The book and author do not disappoint. There are so many helpful and practical tips shared and in terms I can understand as a novice. Amazing! - Great and easy to understand and very complete. Very highly recommended. The guy REALLY knows what he's talking about. Awesome Book - Bought this book right after I got the camera - was the best decision I made. It shows the key points of setting up and taking images with the Canon T3i. I am a novice when it comes to dSLR's and I still felt this book helped me a ton. Would highly recommend it to anyone. with this Canon Rebel T3i / EOS 600D e-book user's guide.